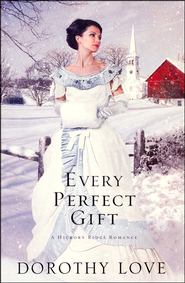 Every Perfect Gift by Dorothy Love is a historical novel set in 1886 Tennessee. Sophie Caldwell returns to the town she grew up in while living in an orphanage. Sophie is quite the writer and after working for a newspaper in Texas she decides to start one in Hickory Ridge in order to prove to herself and others that she is a capable woman. While reporting on a the new Blue Smoke resort in town she meets Ethan Heyward who she can't seem to get out of her mind. Sophie and Ethan both have clouded past that they have no desire to discuss or think about but seem to follow them everywhere they go. Will they learn to settle with the past before moving on with their future? I discovered that Every Perfect Gift is the third and final book to the Hickory Ridge novels and that they are Dorothy Love's debut novels. I haven't read the first two books so I'm sure some of the characters in the book I didn't know as much as I could. You can definitely read this book alone from the first two books though. The cover is absolutely beautiful and one of the best I think I have ever seen, especially for a winter novel. I loved the concept of Sophie starting her own newspaper and following her around while she reported on stories. I enjoyed the characters and main plot to the story, although it is extremely predictable. The story is a little slow going but still an enjoyable read. I will be looking into the other two books to add to my reading list. Thank you! It is a great book!